Ok, so I'm a geek, let's just get that out of the way. Back in the mid 1970's when I designed and built my own 8008 based computer the Mark 8 had already been released. It was designed by Jon Titus and published in the July 1974 edition of Radio Electronics magazine. I remember thumbing through the pages over and over fascinated by the Mark 8. Even though the Mark 8 was a really cool computer I was more interested in designing and building my own. Building my own 8008 computer was a project that spanned three years. At the time I made the right decision. Designing building my own computer taught me more that I could have gotten with a four year college degree. I learned about hardware and software design, construction, trouble shooting, and a lot about patience. But most of all I learned a lot about myself! 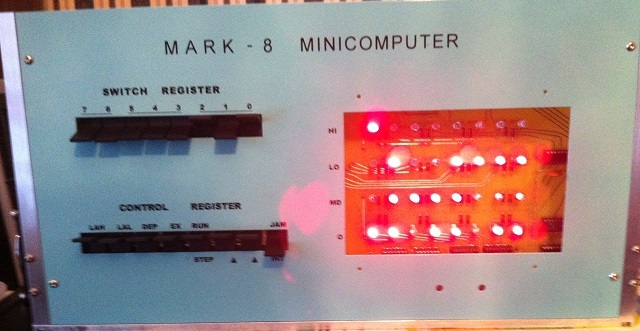 Today it's over 40 years from the time I completed my own 8008 I've revisited the Mark 8 by building my own. This project started over a decade ago when I bought a kit of parts and printed circuit boards off eBay. As soon as I got the kit I soldered together the boards, but put it aside because I was torn about the way the boards needed to be wired together. Ten years later I decided to put molex connectors on the boards so they could be plugged into a back plane. The results are fantastic!!! Brining the Mark 8 to life brought a million memories rushing back in. It’s ironic how much pleasure I get from toggling in a simple program and seeing the lights blink. Here is a picture of Jon Titus after he signed my Mark 8. I'm very fortunate to be good friends with Jon. We try to get togehter for lunch on a monthly basis and have great conversations about old and new technology.